Individual retirement accounts, known as IRAs, are basically savings plans with lots of restrictions. The main advantage of an IRA is that you can defer paying taxes on the earnings and growth of your savings until you actually withdraw the money. The main disadvantage is that tax law imposes penalties if you have to withdraw any of the funds before you reach age 59 1/2. There are several different types of IRAs. Each has its own tax implications and eligibility requirements. You can claim a tax deduction when you contribute money to a traditional IRA. Since this deduction reduces your taxable income, you don't pay income tax on the money you set aside in the account. The savings grow tax-deferred. You won't have to include interest, dividends, or capital gains from the IRA on your annual tax return. When you withdraw the money, the distribution from the IRA is included in your taxable income. It's taxed as ordinary income. You're effectively paying taxes later on money you earn today, thanks to that tax deduction for your contributions. Many retirees find themselves in lower tax brackets than they were subject to when they were working and earning, so you might end up paying less of a tax rate on that money. You won't just pay income tax on the money if you have to withdraw some of it prior to retirement. You'll also pay an additional 10-percent tax penalty on that early distribution if you withdraw the money before you reach age 59 1/2. You must begin withdrawing money from a traditional IRA beginning in the year you reach age 70 1/2. You must take at least the required minimum distribution or "RMD" each year. Otherwise, you'll be hit with an excise tax of 50 percent of the RMD amount you didn't pay regular income tax on because you didn't withdraw the money. There are some restrictions as to who can take a deduction for traditional IRA contributions. If you or your spouse are also covered by a retirement plan at work, your deduction may be limited, or you might not be able to deduct any of your contribution at all. A nondeductible IRA is a traditional IRA, but the contributions aren't tax-deductible. What's the advantage in this? The savings will still grow tax-deferred until you begin to take distributions, and the principal portion of those distributions are tax-free in retirement because you already paid taxes on the invested money when you earned it. The growth portion is taxed as ordinary income. They're covered by a retirement plan through their employer. Their incomes are too high to be eligible to deduct their traditional IRA contributions. They aren't eligible to fund a Roth IRA. They want to contribute extra savings towards retirement in a tax-deferred account. 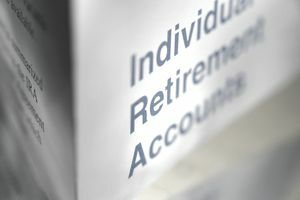 The primary difference between a nondeductible IRA and a traditional IRA is the tax treatment of the original contribution. All the other rules that apply to traditional IRAs also apply here. There's still a 10-percent surtax penalty on early distributions, and distributions must begin in the year the account holder reaches age 70 1/2. A Roth IRA provides potentially tax-free savings and distributions. Unlike a traditional IRA, you don't get a deduction for your contributions when you make them. This makes these accounts similar to nondeductible IRAs, but there are significant differences in how the distributions are taxed. You don't have to pay income tax on the earnings and growth of the savings inside a Roth IRA. Distributions from a Roth IRA are completely tax-free if you meet certain conditions. You can contribute to a Roth IRA even if you're covered by a retirement plan at work. Roth IRAs have some income limitations. Required minimum distribution rules don't apply to Roth IRAs. The total amount you can contribute to a traditional IRA or a Roth IRA each year, or any combination of the two, is limited to $5,500 as of 2018. This limit has remained unchanged since 2013 when it increased from the $5,000 limit that was in place in 2012. But you can contribute more if you're age 50 or older—up to an additional $1,000. This is known as a "catch-up" contribution, and it remains the same from year to year. These contribution limits apply across traditional, nondeductible, and Roth IRA types. If you want to fund both a traditional IRA and a Roth IRA, you can contribute any combination of funds to each, but the combined total can't exceed the annual limit. For example, you might put $2,750 into a traditional IRA and another $2,750 into a Roth IRA. SEP IRAs are a type of group retirement plan. An employer establishes the SEP IRA plan, then makes contributions to a traditional IRA that's set up inside the SEP IRA. These plans are popular with self-employed people because they allow for higher contribution limits than regular IRAs. Otherwise, SEP IRAs are treated similarly to traditional IRAs. Contributions are made with pre-tax dollars, distributions are taxed as ordinary income, and there are penalties for taking early distributions. SIMPLE IRAs are also a form of group retirement plan. They're easier to set up and maintain than 401(k) or pension plans, but they offer lower contribution limits than other group plans. SIMPLE IRAs allow you to contribute pre-tax dollars with matching contributions from your employer. Distributions are taxed as ordinary income, and there are penalties for early distributions. You can contribute funds to an IRA at any time throughout the year. After the year has ended, you can still make a contribution towards the previous year's IRA as long as the contribution is made by the April tax deadline. This means that for the tax year 2018, the deadline for funding IRAs is April 17, 2019.